Invasive species were recently listed as one of the most important hazards to New Jersey�s natural habitats (www.state.nj.us/dep/dsr/njcrp/executive-summary.pdf). In the centuries since European settlement, such organisms have already changed the face of natural environments throughout New Jersey and around the world, and have the potential to change it yet further if rates of new introductions continue at recent levels. Yet while most people have some appreciation of the role of pollutants and overdevelopment on the natural environments around them, many have little or no appreciation of the damaging effects of invasive species. This site provides free lesson plans and associated activities to support middle school teachers in providing a 2-week learning unit for their students, centered around invasive species. Lesson plans are designed to meet federal and state core content standards for middle school educators and include a series of interconnected, inquiry based activities. These lesson plans span the curriculum with interconnected themes and activities designed to meet the needs of all learners. They are designed to teach students about invasive species, while building basic math, geography, reading and writing skills. We also provide lesson plans for use in social science classes as well as a variety of activities appropriate for use in art and physical education classes. Files containing worksheets, flashcards and other media are also provided for teachers to printout for use with their classes. It is large, has a distinctive appearance and is extremely widely distributed within New Jersey and beyond, increasing the chances that every student in the class will have seen this species near where they live. In many, if not most, cases students and teachers would be able to collect materials for use in class activities on or near their school�s property, perhaps as part of the class activity. 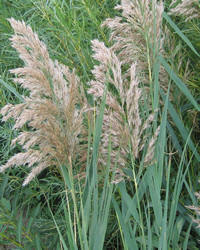 It is a major invasive species with a clear and often negative impact upon the landscapes in which it is found. It has a long and interesting history that will allow us to create entrees for engaging students who might not otherwise be interested in "science." It is conducive to use in a wide variety of craft activities, which again creates opportunities for engaging students in the learning process. NOTE TO TEACHERS: If you develop additional lesson plans to connect with those provided at this site, please feel free to send them to us and we will add them to the list of resources available to other teachers (with appropriate attribution, of course!). 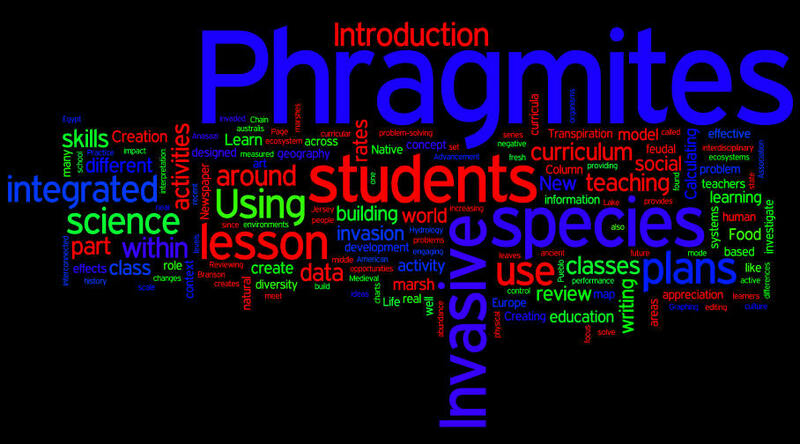 Acknowledgements: This entire project grew out of an idea that was generated by Philadelphia artist Linda Lorrie Gross for bringing Phragmites into the classroom to build awareness about invasive species and the problems that they cause. Many of the initial ideas and art projects included in this ICU were generated in brainstorming sessions in Lorrie's kitchen. Thanks Lorrie. We couldn't have done it without you! The project was then moved forward through the volunteer work of Erin O'Connell who generated many of the ideas that later became the lesson plans you see here. Thanks also to David Williams for proof-reading all of the lesson plans provided here. Although the information in this document has been funded wholly or in part by the United States Environmental Protection Agency under assistance agreement NE97262206 to Georgian Court University, it has not gone through the Agency's publications review process and, therefore, may not necessarily reflect the views of the Agency and no official endorsement should be inferred.